I have used hook_permission to limit user for some places and to created a permission rule. However, I have not combine two permission from another modules for my custom module. I'm working on a module that would allow user to used the Administration Menu when user are on a Desktop and used the Mobile Friendly Navigation Toolbar when the user is on a mobile. I'm using the hook_page_build to hide the css from mobile or desktop display. So now I'm trying to limited the hook_page_build to user that only have access to the Administration Menu and the Mobile Friendly Navigation Toolbar. To be more specific here is the permission that I want user to have enable before this module is been load. 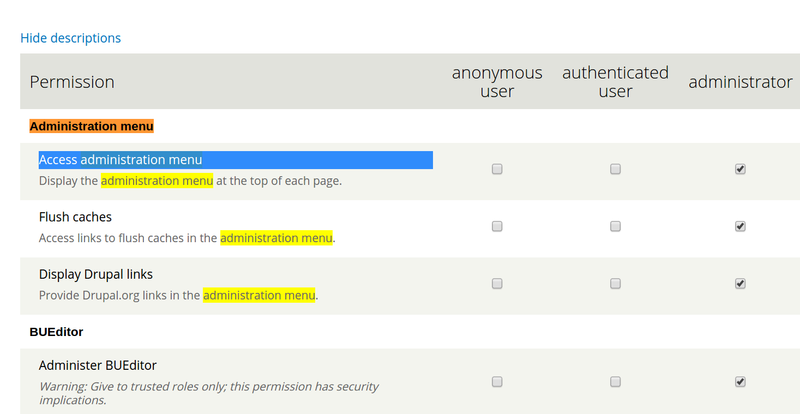 And the another permission that user need to have is Use the administration navbar. Once these two permission have been granted the my custom module is going to be able load. How can I do this ? // Check if user have access to navbar. Not the answer you're looking for? Browse other questions tagged routes users toolbar or ask your own question. How can I get Drupal to hide menu items that user does not have permission for?